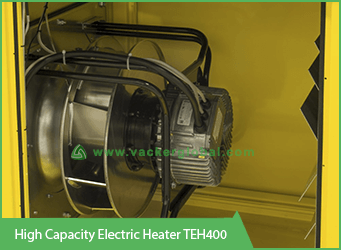 Electrical heaters use the principle of conversion of electrical energy into heat energy through coils. 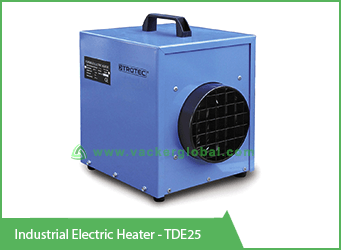 We supply numerous models of electric heaters for residential and industrial applications. Few of our major models are listed here. 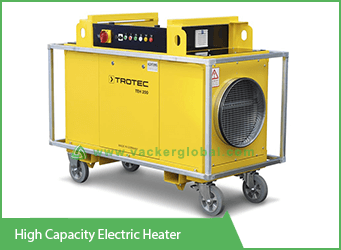 We are supplying all the models manufactured by Trotec, Germany. These are the smallest type of heaters suitable for halls, rooms, offices, warehouses etc. They have a thermostat for auto functioning. These are economic models with optimum power consumption. 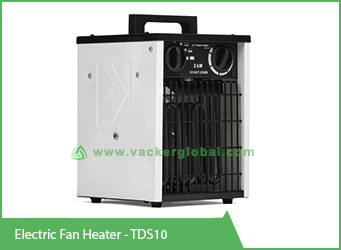 These heaters do not consume oxygen and hence are suitable for closed rooms without ventilation. The smallest and the biggest models are listed here. For full details, please see the comparison chart at the end of the page. This model has a capacity of 3 Kilowatt. It operates on 230v, 50 Hz and consumes a current of 13.4 Ampere approximately. It is extremely silent producing only 50 to 53 decibels at a distance of 1 meter. It has a 3 stage operation. The third stage produces maximum capacity of 3 kW. It produces an air volume of 411 cubic meter per hour. It is lightweight and portable with a weight of 3.2 kg only. In stage 1, you can operate only the fan without the heater. This is the biggest model in this series with a maximum output of 30 kW. It has 3 stage operation and the third stage produces maximum output. It produces an air volume of 1900 cubic meter per hour. It is capable of producing a temperature increase of 136°C. It operates on 3 Phase, 400V, 50 Hz and consumes a current of 43.3 Amperes approximately. It has wheels for easy maneuverability. The sound produced is 61 decibels at a distance of 1 meter from the heater. It has an overheating protection system. 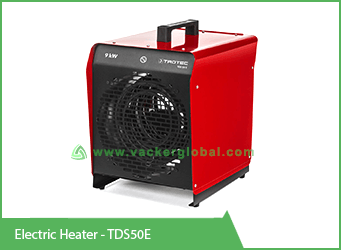 The electric power consumption of this heater is approximately 30 kW. These are bigger, yet portable models of electric heaters. These are suitable for industrial applications, construction sites, big warehouses, factories, etc. This is the smallest model in this series with a heat output of 3 kW. It has a very high air capacity of 320 cubic meters per hour. It can produce a temperature increase of 32.6°C. It can operate at ambient temperature from -20 to 45°C. It operates on 230v, 50 Hz and consumes a current of 13.0 Ampere approximately. In spite of its performance, it is extremely silent producing only 49 decibels at 1 meter. It is a light model with a weight of 4 kg only. This is the biggest out of 3 models in this series. It produces maximum output of 9 kW at the third stage. It has a very high air capacity of 845 cubic meters per hour. It can generate a temperature increase of 150°C. It operates on 3 Phase, 400v, 50 Hz and consumes a current of 13.0 Amperes approximately. The weight of the heater is 10 kg. It produces 55 decibels at 1 meter. 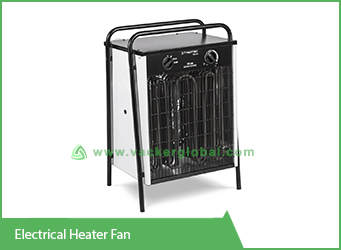 These are economic, medium range of electric heaters for medium type of commercial applications. There are seven models starting from TDS 10 to TDS 120. The smallest and biggest models are explained here. These models can be mounted on the wall or ceiling as well. This is a very small model with a maximum output of 2 kW. The air circulation capacity is 186 cubic meter per hour. It can produce a temperature increase of 95°C. It works on an electrical connection of single phase 230 V, 50 Hz. It consumes a current of 8.7 Ampere. It has a protection against overheating. The weight of the heater excluding packing is 3.5 kg. This is the biggest model in this series producing 30kW of heating power.IT has 3 stages of operation. It can produce a temperature increase of 130°C. It is fitted with axial fans. IT operates on 3 Phase 440V, 50 Hz electrical power. The weight of the machine excluding packing is 26 kg. These are special models with double walls, so that the body does not get hot. These are rugged models suitable for industrial as well as residential applications. It has galvanized air intake grills. This has a single stage operation producing electric heat output of 3 kW. It has an air handling capacity of 250 cubic meter per hour. It generates an increase in temperature of 36°C. It operates on 230 V, 50 Hz electric connection. The average current consumption is 13.5 Ampere. The weight of the machine excluding package is 13 kg. 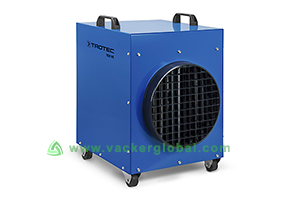 You can provide air hoses to this industrial heater for circulating air to farther distances. This has a 4 stage operation producing maximum electrical output of 18 kW. It has a very high air handling of 1,520 cubic meter per hour. It can produce a temperature increase of 35°C. It operates on 3 Phase, 400 V, 50 Hz connection. The weight of the machine is 30 kg. 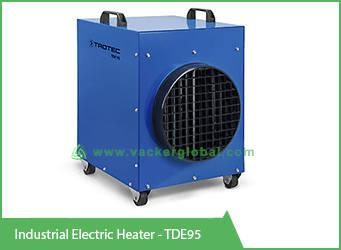 These are extremely robust, industrial models of industrial electric heaters. There are 4 models in this series. These can be connected to an air hose for circulating air in large areas. This has a maximum heat output of 2.5kW with an air handling of 300 cubic meter per hour. IT can generate a temperature increase of 40°C. It operates on a single phase 230 Volt, 50 Hz mains line. It can connect to a hose of 155 mm diameter. We supply special hoses, which can withstand the temperature. It has a weight of 10.7 kg approximately. 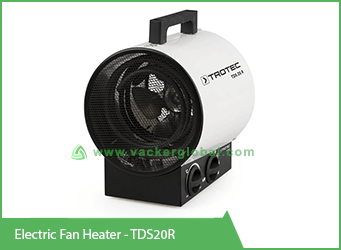 It is a 4 stage heater producing a maximum electric output of 18 kW. It has a high air handling capacity of 1,785 cubic meter per hour. It has an in built axial fan. Customer can connect the heater to a hose of 300 mm diameter to a maximum length of 15 meter. The hoses have to be heat resistant. The weight without packaging is 30 kg approximately. 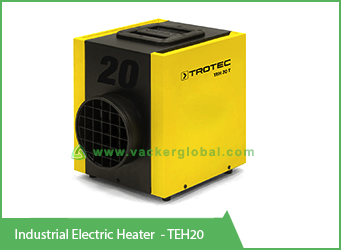 Model TEH 200 and above are very high capacity industrial electric heaters. This model has a maximum heat output of 40 kW. It handles air to the tune of 3000 cubic meter per hour. IT has a maximum air pressure of 600 Pascal. The fan is axial type. The temperature of the output air will be 60°C maximum. It has 7 stages of operations at different levels. 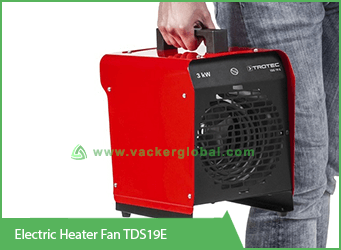 You can connect this heater to a hose of 450 mm diameter to a maximum length of 100 meter. This is the biggest model in this series with a maximum heat output of 120 kW. It has an air handling capacity of 9000 cubic meter per hour. It generates an air pressure of 600 Pascal. The fan type is radial and the heater has an 8 stage operation. It operates on 3 Phase 400 V, 50-60 Hz electrical power. 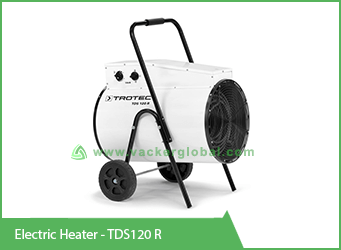 You can connect this heater to a hose of 450 mm diameter to a maximum length of 100 meter.